Twenty one researchers in areas ranging from optics, medicine, psychology and education were recognized last week in what has become a much-anticipated campus tradition – induction into the UCF Millionaires Club. The club, which was established in 2000, recognizes researchers who have received external sponsored funding of $1 million or more in the last fiscal year. In addition to the millionaires, 95 innovators, researchers who have taken the first step in the patenting process by filing invention disclosures, were recognized as well. 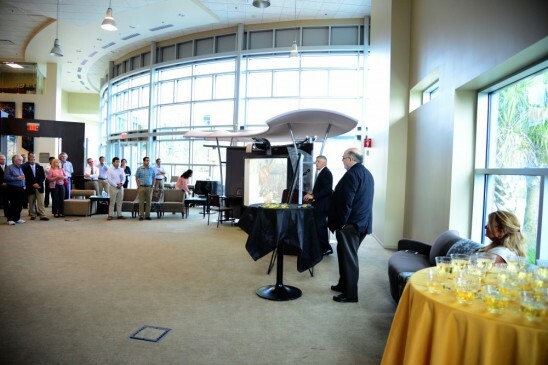 In a ceremony at UCF’s Morgridge International Reading Center, UCF Provost Tony Waldrop congratulated the researchers for their role in UCF’s rapid rise as a major metropolitan research university. “The entire Florida economy counts on your work,” he said. MJ Soileau, vice president for research and commercialization, presented each millionaire with a custom UCF Millionaire lapel pin and a flash drive containing professional portraits that were taken of them over the last month. Soileau also recognized 11 new faculty and encouraged them to seek out the advice and experience of their successful peers. Soileau started the event shortly after he became vice president to celebrate the accomplishments of highly funded researchers much in the same manner that universities traditionally celebrate the success of sports teams.